> Lithium-Ion Batteries – A New Fire Risk? Lithium-Ion Batteries – A New Fire Risk? Lithium-ion (Li-ion) batteries have already established themselves as an indispensable source of energy in all fields of life, and they will become even more widespread as they are seen as the key to e-mobility – the way to make private transport emission-free and environmentally friendly in the coming years. They are also replacing portable energy sources such as nickel-cadmium NiCd), nickel-metal hydride (NiMH) and lead batteries in modern communication and media technology, in household appliances, in workshop and gardening equipment and in medical technology. The reason for the rapid spread of Li-ion batteries lies in their high volumic energy, numerous charge cycles without significant capacity degradation and their tolerance for partial charging and discharging. Following a brief overview, this article describes how Li-ion batteries work, what applications they have, the potential hazards of the technology, and fire prevention especially during storage. In our modern world, we cannot imagine life without Li-ion batteries and accumulators. As well as being used as energy storage units in portable household appliances, electronics (mobile phones, notebooks and portable speakers), electric tools and gardening equipment, they are playing an increasingly significant role in e-mobility, i.e., electric bicycles and vehicles. They are also being more frequently used in aeroplanes, ships and electricity storage units as they can store significantly more energy than traditional batteries and accumulators – although this can also greatly increase the magnitude of damage if a fire does occur. Li-ion batteries and accumulators, also known as rechargeable Li-ion batteries, are chemical energy storage units that can release their stored charge in the form of electrical energy through an electrochemical reaction. 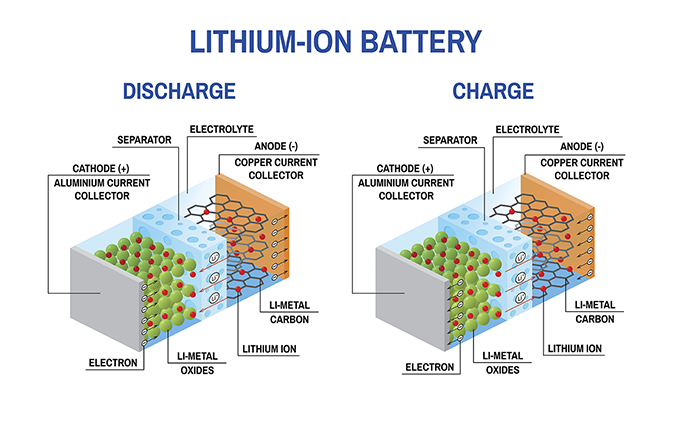 Inside the battery, lithium ions travel through an electrolyte between a cathode and an anode. When the battery is charged, positively charged lithium ions travel through the electrolyte from the positive electrode (the cathode) to the negative anode, while the charged current carries the electrons through the external circuit. When the battery is discharged, the ions travel through the separator from the anode, where they embed themselves in a carbon matrix during the charging process, to the cathode. The cathode and anode can consist of various materials; for instance, the cathode can be made of lithium cobalt oxide, lithium manganese oxide or lithium iron phosphate, and the anode can be made of carbon, metallic lithium and lithium titanate or amorphous silicon. Amorphous silicon can hold significantly larger quantities of lithium ions than the hexagonal carbon structures of graphite anodes. Lithium polymer (LiPo) batteries are exceptionally flexible in terms of their design and are resistant to deformation. They work the same way, yet contain layers of synthetic film. Li-ion batteries store electrical energy and usually contain a flammable electrolyte and other flammable components (including polymer separators, various adhesive agents in the electrodes and the anode material, e.g., graphite). Therefore, Li-ion batteries and accumulators will react very differently in a fire compared to lead batteries or NiMH or NiCD batteries whose electrolytes are water-based. Strong currents are possible (temperature increases caused by electric arcs, short circuits etc.). If there is a fire, poisonous and/or flammable contents can leak and form an explosive mixture. The materials and components have a high fire load. Normally caused by an electronic error or mechanical damage, thermal runaway is a typical fire scenario for Li-ion batteries and accumulators. It starts in relatively unspectacular fashion: The oxidation of the electrolyte heats the interior of the battery to around 80°C, causing gas and steam to appear in the cell. If this process is not stopped, it triggers a chain reaction. At around 120°C, the separator between the anode and cathode melts. This causes a short circuit and the thermal decomposition of the cathode. This releases oxygen which, combined with the heat energy, ignites the materials in the anode, cathode and electrolyte (mainly organic solvents, light metals and graphite). At this stage, temperatures can reach up to 1,000°C. The potential danger of lithium batteries is determined by the product design and the output of the modules/system itself in particular. In the experiments carried out in the U.S. by FM Global5 and other organisations6 where the cardboard packaging of Li-ion batteries was set alight, the batteries caught fire around five minutes after the packaging did. Whereas the transport regulations classify Li-ion batteries and accumulators as dangerous goods, which means that transporting them is subject to considerable safety regulations,9 there are still no mandatory rules or regulations concerning how they are to be stored or used. Adhere to the specifications of the manufacturer and the technical product data sheets when storing and using Li-ion batteries. Prevent external short circuits (protect the battery poles from short circuiting, e.g., with terminal covers). Prevent internal short circuits (prevent mechanical damage). Do not expose the batteries to high temperatures or heat sources directly or for extended periods of time (e.g. direct sunlight). Storage areas/buildings for batteries and accumulators should be at least five metres away from other areas or separated by a fire-proof construction. Batteries should not be stored with other products that could accelerate a fire. The storage area should be monitored by a suitable fire alarm system linked to a constantly staffed office so as to ensure that the alarm is raised as quickly as possible. Larger storage areas should be fitted with automatic water extinguishing systems, such as sprinklers or deluge systems. If the storage area already has a fire extinguishing system, the information in the technical product data sheets regarding suitable extinguishing agents should be taken into consideration. For larger quantities in storage (over 60m² of space occupied and/or stacks over 3 metres tall), it is also advisable to store the Li-ion batteries/accumulators in suitable non-flammable containers, separate fire-proof rooms or fire compartments. Keep the number of Li-ion batteries and accumulators in storage to a minimum (the daily requirement). Ideally, they should be stored temporarily in reasonable non-flammable transport containers. Store a sufficient number of suitable fire extinguishing devices (including wall hydrants) in the vicinity of the storage area. In areas that are not protected by automatic extinguishing systems, the batteries must be kept at least 2.5 metres away from other flammable materials, either in a different room or building. Damaged or defective Li-ion batteries must be removed from storage and production areas immediately and stored a safe distance away in a non-flammable container or separate fire compartment until they have been disposed. Employees should be made aware of the potential dangers of Li-ion batteries and accumulators, and trained in first response. In principle, Li-ion battery and accumulator fires can be fought with water. The rise of Li-ion batteries and accumulators cannot be slowed in the foreseeable future as their cost-effectiveness is unrivalled. This is why they are now found everywhere all the time. 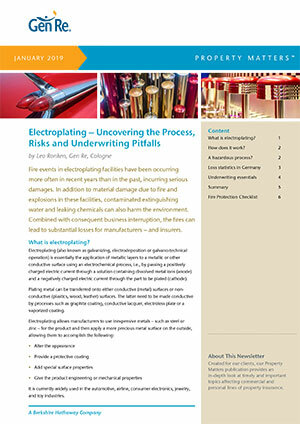 In addition to the risks to companies that manufacture these batteries and accumulators, from an insurance perspective there are further risks wherever Li-ion batteries or accumulators are used and/or stored on a larger scale, especially in mobile device retail and in manufacturing and industrial businesses. Given their particular risks, any risk assessment should therefore take the presence of Li-ion batteries and accumulators into account. This means that regardless if in a manufacturing process or storage the presence, quantities and storage conditions of Lithium-Ion batteries should be identified and noted in a risk assessment as it would be done for flammable liquids and gases. At the same time, supplementary safety measures should be recommended to the policyholder if deficiencies are identified.